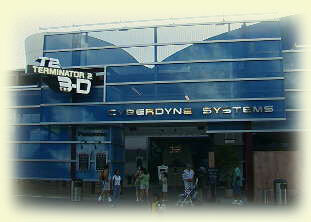 Located in the upper lot (Entertainment Center) of Universal Studios Hollywood, at Baker Street, is Cyberdyne System's office in Los Angeles. The building is constructed on top of the Frankenstein parking structure (previously known as the Laramie parking structure). Before 1999, the area was occupied with an outdoor stage. There's a rumour that the force of the sudden drop of the auditorium seating at the climax of the show meant the parking structure suffered some minor structural damage as the show was being tested. The parking structure then had to be reinforced to take the extra load. It's believed that the distinctive mosaic paint finish to the outside of the building is a massively enlarged pixellated frame from the original Terminator movie. 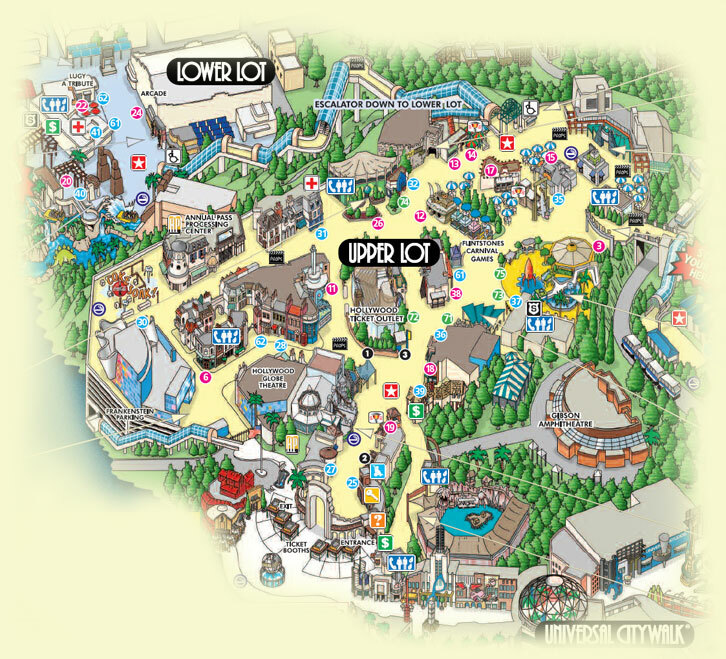 As can be seen from the next aerial photo, the show building is split into 5 areas: at the bottom of the photo is the queue area with the distinctive coloured discs / sunshades. The block surrounded by the discs is the pre-show Kimberly Duncan presentation area, then the bulk of the rest of the building is the large main auditorium. The side walls mirror the shape of the side screens, while the 4 brown air-conditioning units on the roof indicate the extent of the stage area. The section beyond this at the top of the photo is the backstage area. The block on the right side of the building houses break rooms and the T2 Gear & Supplies merchandise shop. In front of the merchandise shop is also the Cyber Grill restaurant. In 2000, they removed the Terminator 2 3D logo and replaced it with lettering. Later, in 2007, they changed the red "safety visors" into a green version. Some pics of the decorations. Some shots of the Frankenstein parking building (which houses the Terminator 2 3D attraction).